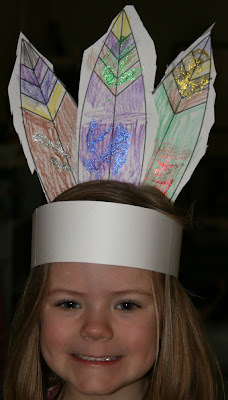 Here is Maggie in her (short i) I-I-Indian headdress. She cut out all the feathers by herself…and yes, that is glitter. It’s a very glamorous headdress. I have the exact same one. scary. Wow. Very nice. I’m pretty sure I’ve made about 46 such papercrafts. happy birthday to our favorite annie grook! bean on happy birthday to our favorite annie grook!